Our costumes are handmade. Our animals are trained by us. Our sets are painted in the barns on our farm. We burn the midnight oil to conjure new visions for the show. It's all we do. Circus is our job, our life, our love. 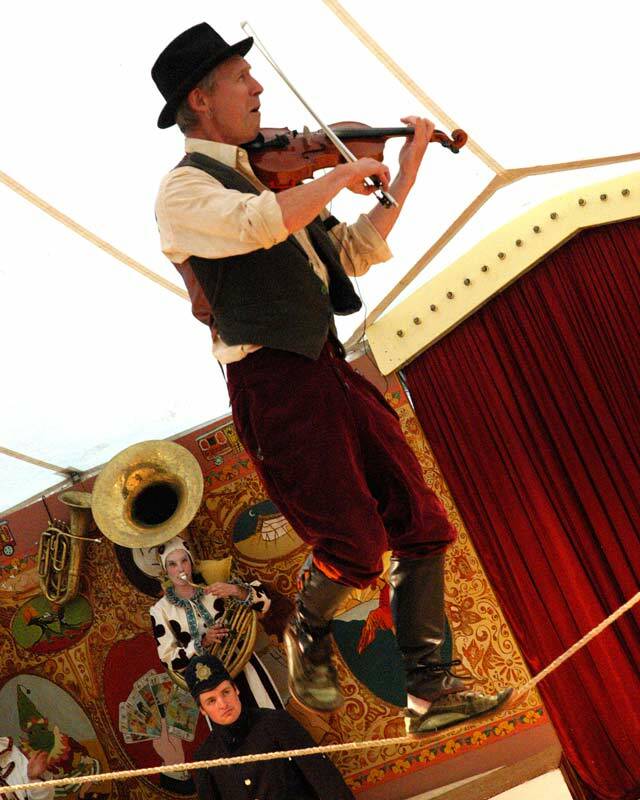 Come to Giffords Circus and be a part of the magic. Since that start in 2000 we have entertained over a million people, and have worked with some extraordinary circus performers and creative:– the mercurial comic genius Tweedy; Attila, a Hungarian horseman from the Great Hungarian Plane; Gabor Vosteen who played Mozart on five recorders, three in his mouth, one in each nostril; Molly Molloy, the choreographer who redefines Burlesque; eccentric dancer Barry Grantham. Toti and I have travelled to Paris, Moscow, rural Hungary, Romania and beyond in search of talent and in search of people who are prepared to give up their own life temporarily and throw their lot in with ours and bring their mastery of a certain skill to our show. Gypsy violinists, tap dancers, tight-rope walkers, trapeze artistes, stunt riders, opera singers, magicians, illusionists, gymnasts – all have inhabited Giffords Circus, and traveled with us, stopping to camp on village greens and throw open our doors to the rural families, farmers, weekenders, tourists, filmstars, rockstars, artists, pensioners, shop keepers, school children who so love our show and who make up our audience. Horses are at the heart Giffords Circus. We both grew up riding horses. The compelling adventure of horses is something that once experienced is hard to forget or turn away from. Horses inspire each new show and the shows revolve around them. For example the chestnut horses in The Cockerel Show, Red and Rooster, were a starting point for the bright colours and dynamic energy of that production. The pair of Shires who entered the ring with one man riding astride both of them was at the heart of our interpretation of War and Peace in 2011 – they were the undefeatable spirit of the Russian soldier. Since 2012 we have worked with brilliant comedy director Cal McCrystal, whose credits include Paddington Bear and One Man Two Guvnors. Maverick, naughty and uncompromising, Cal leads the company through a three-week rehearsal period at our farm in the Cotswolds.